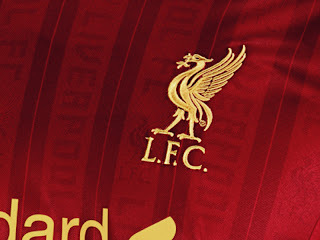 Soccer1203 a place for all soccer fans: Feature of Liverpool's 2013-14 Home Kits! 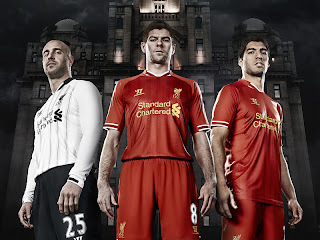 Feature of Liverpool's 2013-14 Home Kits! True to tradition, the new Liverpool home uniform is of course all red with white and gold trim. The goalkeeper strip is made up of a white jersey, black shorts and black socks. Manufacturer Warrior highlighted the three-piece collar, sublimation print and mirrored sleeve detailing as the three main differences to the new design, which took inspiration from the outfit players wore for Liverpool's fourth European Cup success. Warrior's War-Tech has been used on the new kit. This technology revolves around the fabric of the shirt being light and breathable. The fabric will also be moisture-wicking, designed to help keep players dry from sweat in the most humid of conditions. Current Liverpool manager Brendan Rodgers was very pleased with the final outcome of the jersey. "It’s distinctly Liverpool which the players and I love," he said. "It exceeds what we need it to do technically while also delivering a strong visual statement." 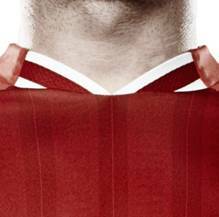 The new three-piece collar introduced with the 2013-14 uniform sees Liverpool revert back to a classic style which was prevalent in the 1980s, most notably when it won its fourth European title, with the white marks defining the overall look. Also on the shirt's neck, a '96' logo with two Eternal Flames is embroidered to commemorate the Hillsborough disaster in 1989. Former Liverpool star Alan Kennedy particularly likes the collar and stripe. "I really like the shirt. The stripe and collar details resemble the shirt we wore during the Cup final in 1984," he said. "The new shirt is very light and I’m told the material will keep players cool, something we desperately needed back when we were playing in the sweltering heat in Rome." 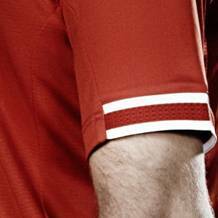 Up next is the sleeve detailing, with both arms of the jersey having two white stripes, split by a red one, going round half the circumference of the sleeve. This design marks a big difference to this season's shirt, with its plain and bare sleeves. Club captain Steven Gerrard says the comfort is the most important thing from the players' perspectives, and he is delighted with it. "To me comfort is the most important thing. You want to be comfortable out on the pitch; the work we are going to be doing is tough," Gerrard said. "We’re going to be sweating a lot in different weather conditions so it is important the kit is right. We’re really happy with it." The most noticeable difference to the new kit from the current edition is the subliminal printing which covers the main body of the jersey on the front, leaving the sleeves and back plain. The pin-striped print reads "Liverpool FC" running from top to bottom, with each row separated by two thick lines in a darker red hue, with Warrior aiming to deepen the jersey's visual depth. Liverpool midfielder Lucas Leiva complimented Warrior's design as "beautiful" and added that he is looking forward to wearing it next season. "This is a beautiful kit, the white details give it a very nice touch. Great material and very comfortable," he said. "Warrior have done everything they can to make us feel good in the kit. I’m looking forward to wearing it."